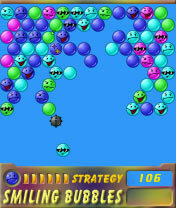 Smiling Bubbles is a great pleasure and new challenge now on your Symbian. They are smiling, chatting, jumping, they are alive! Just start to play and little heroes will become one of your best friends, presenting you sprightly laugh and fun!